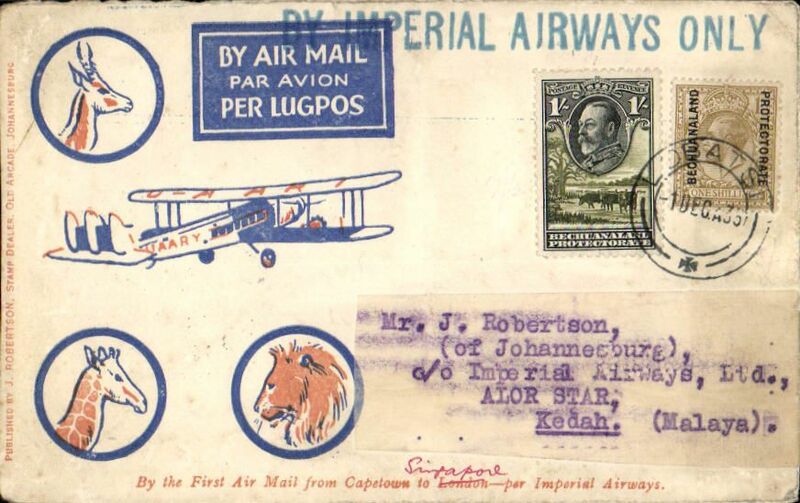 RARE first acceptance of airmail from British Bechuanaland for carriage on the F/F Regular Service from Cape Town to Croydon, Lobatsi to Johannesburg, bs 27/1 6.30pm, via Kimberley 27/1 12.0pm, blue/orange/cream Robertson souvenir cover franked 6d, canc Lobatsi cds, purple straight line 'From Kimberley' hs, Imperial Airways. A superb item in pristine condition. 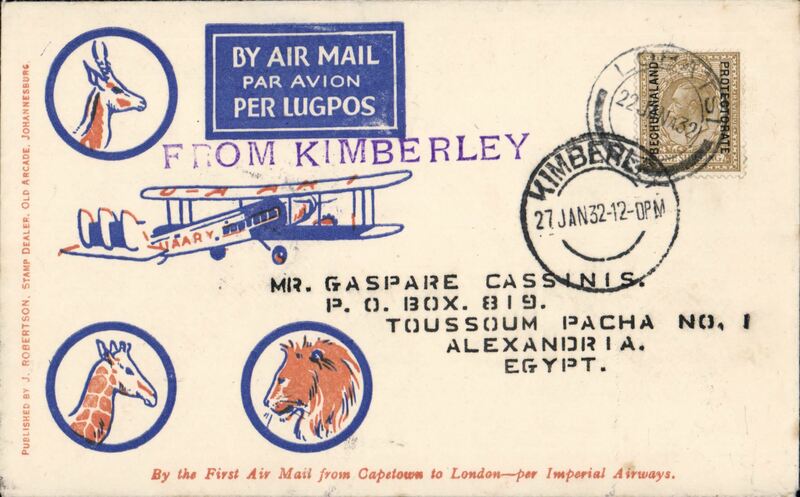 RARE first acceptance of airmail from Bechuanaland for carriage on the F/F Regular Service from Cape Town to Croydon, Lobatsi to London, bs oval registered london arrival of 16 february, via Kimberley 27/1 and Johannesburg 27/1, registered (hs) cover franked 1/4d (rare franking - almost certainly stanley gibbons numbers 95 strip of three & single - catalogued £220 as basic stamps alone), canc by fine double ring Lobatsi cds, ms 'Via First Air Post/Lobatsi-London', This is also a crash cover. 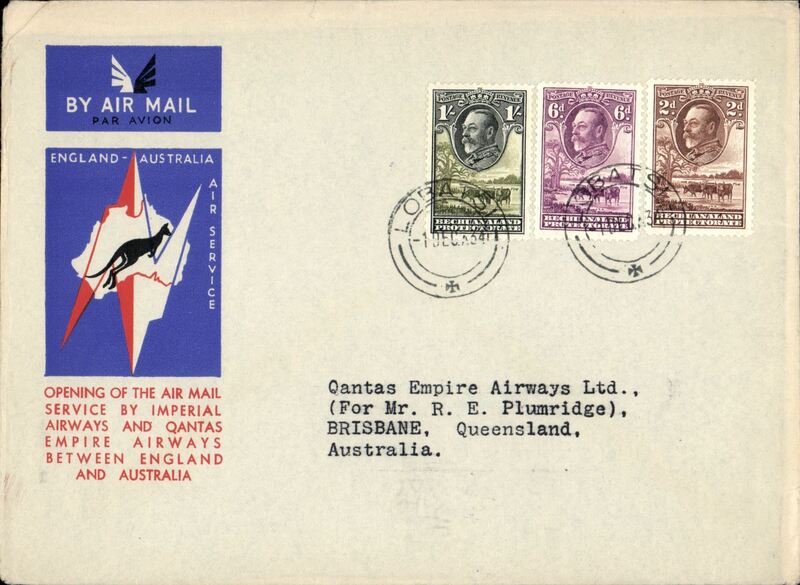 The F/F carrying it from Cape Town to London crashed near Broken Hill, so the mail had to await the second flight - hence its arrival in London on 16/2. A superb item in fine condition. 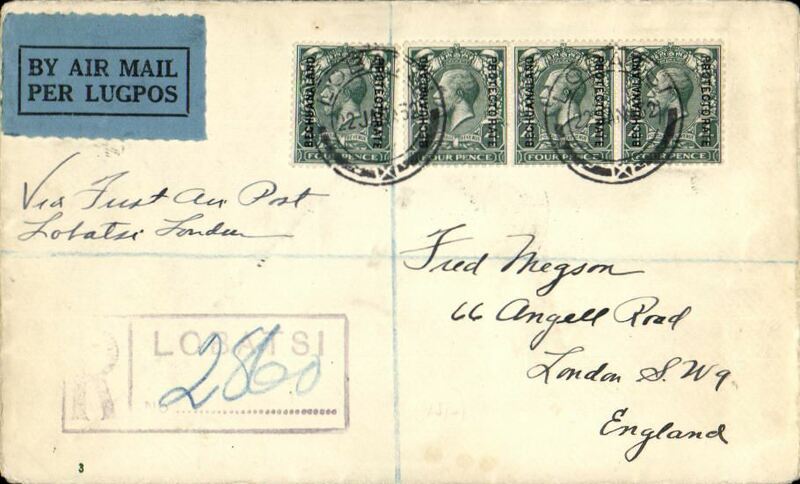 RARE first acceptance of airmail from British Bechuanaland for carriage on the F/F Regular Service from South Africa to England, Lobatsi to Cairo, bs 12/2 via Johannesburg 27/1, blue/orange/cream Robertson souvenir cover addressed to W Tunstall, franked 1/- canc Lobatsi cds, purple straight line 'From Kimberley' hs, Imperial Airways. A superb item in pristine condition. 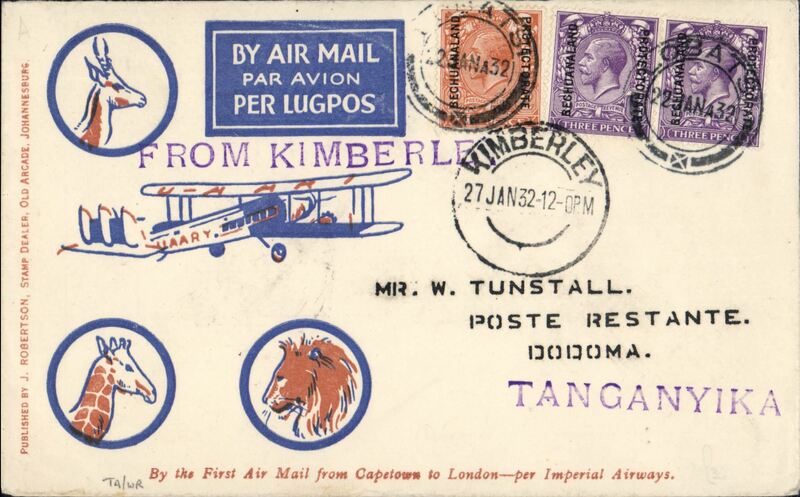 RARE first acceptance of airmail from British Bechuanaland for carriage on the F/F Regular Service from South Africa to England, Lobatsi to Dodoma, Tanganyika, bs 7/2 ,via Mbeya blue/orange/cream Robertson souvenir cover addressed to W Tunstall, franked GV 1/- canc Lobatsi cds, purple straight line 'From Kimberley' hs, Imperial Airways. A fine item in pristine condition. 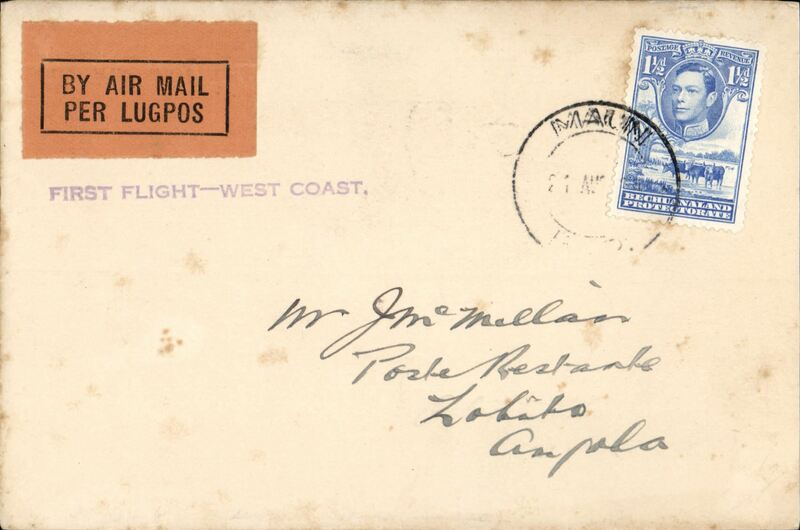 First acceptance of mail for Malaya from Bechuanaland for carriage on the inaugural Imperial Airways Rangoon-Singapore extension, Lobatsi to Alor Star, 21/12, via Cairo, blue/orange/cream Robertson cover franked 1912 Bechuanaland Protectorate opt on GB 1/- and 1933 Bechuanaland 1/-, canc Lobatsi 1 Dec 33 cds, large blue straight line "By Imperial Airways Only" hs. Carried by IAW AN144 from Cape own to Cairo, and IAW IE 246 from Cairo-Singapore. Some rear flap damage, not visible from front, see scan. A truly RARE item. 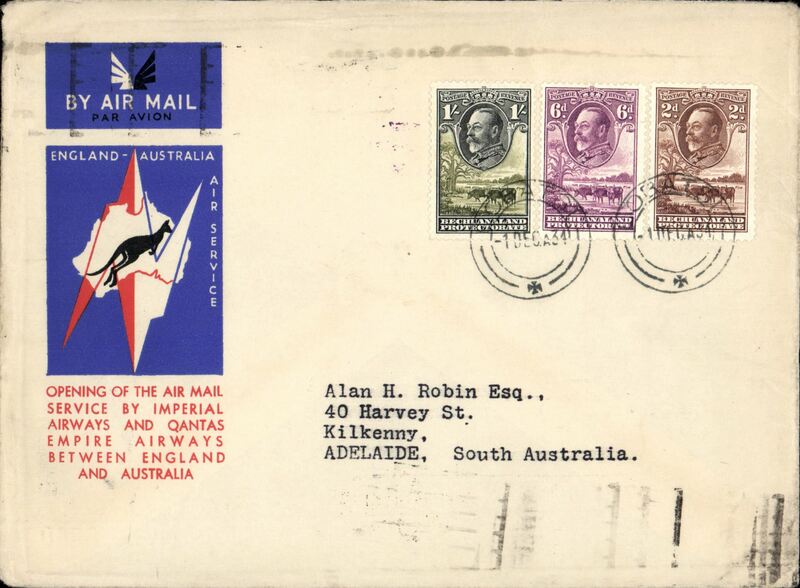 Lobatsi to Australia, bs Adelaide 23/12, first acceptance of African 'all the way' airmail for Australia for carriage on the Imperial Airways African service to Cairo, to connect with the first extension of the IIA/ITCA/Qantas service from Singapore to Brisbane, official 'Kangaroo' cover franked 1/-, 6d and 2d, canc Lobatsi 1 Dec 34 cds. Scarce. 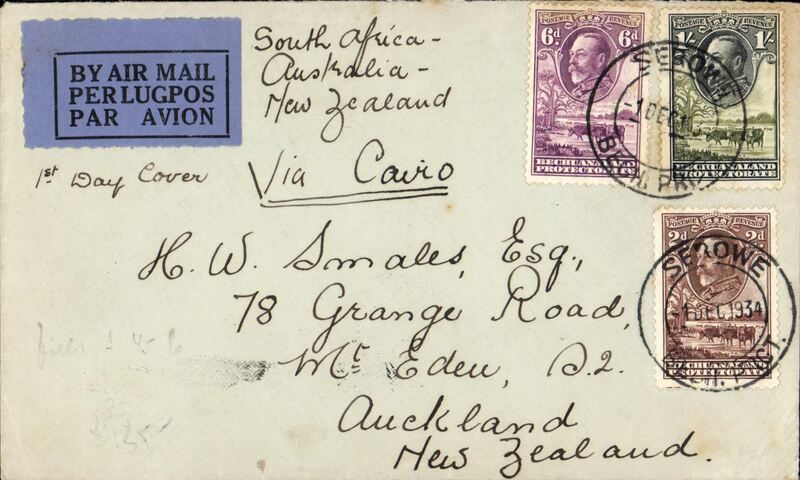 Serowe to New Zealand via Cairo 10/12, first acceptance of African 'all the way' airmail for New Zealand for carriage on the Imperial Airways African service to Cairo, to connect with the first extension of the IIA/ITCA/Qantas service from Singapore to Brisbane, plain cover correctly franked 1/8d, canc Serowe 1 Dec 34 cds. By sea from Brisbane to Auckland. Very scarce. 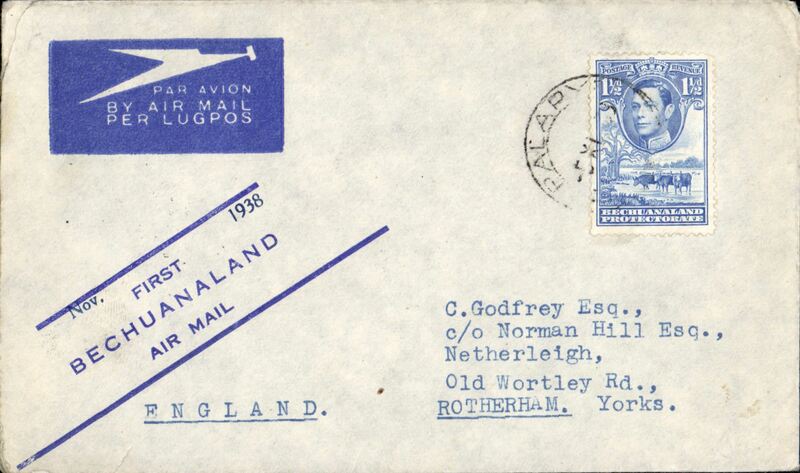 F/F Kalahari Desert service, cover datestamped Palpaye, 5 November 1938, Rotherham, UK arrival cds 12 Nov 38, franked 1 1/2d per 1/2oz EAMS rate. 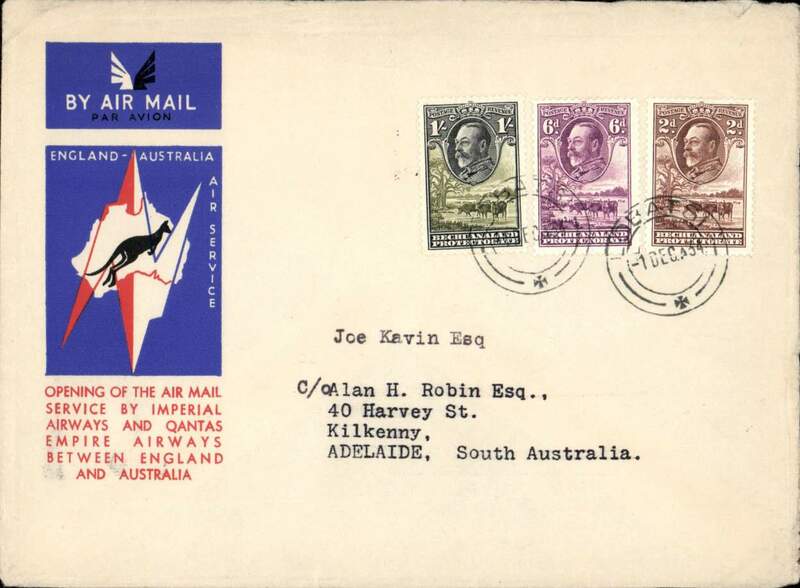 Flown to Jo'burg on 5/11 by the first regular SAA clockwise Kalahari Desert feeder service, operated by the JU86 'Sir Gordon J.Spriggs', then flown on 5/11 by SAA to Lourenco Marques to connect with IA service DN142, operated by the S23 'Challenger' throughout, which departed 6/11 and arrived Southampton 11/11. 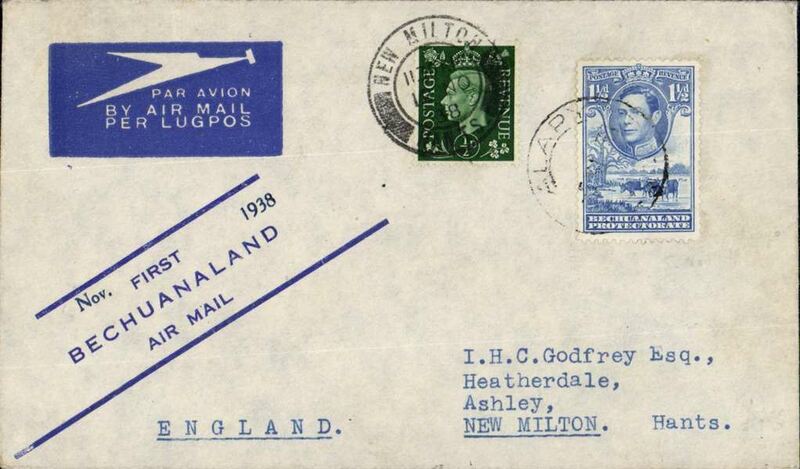 F/F Kalahari Desert service, cover datestamped Palpaye, 5 November 1938, New Milton arrival datestamp on front of 12 November, franked 1 1/2d per 1/2oz EAMS rate. Flown to Jo'burg on 5/11 by the first regular SAA clockwise Kalahari Desert feeder service, operated by the JU86 'Sir Gordon J.Spriggs', then flown on 5/11 by SAA to Lourenco Marques to connect with IA service DN142, operated by the S23 'Challenger' throughout, which departed 6/11 and arrived Southampton 11/11. 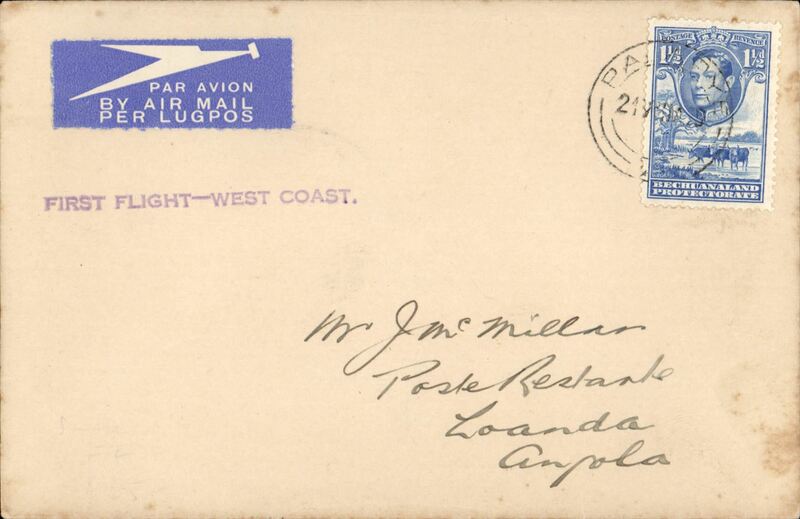 Palapye to Outja, SWA, bs 22/8, SAA new West Coast service, Bechuanaland to South West Africa and Angola, airmail etiquette cover franked 1 1/2d, violet straight line "First Flight West Coast" cachet.. Only three flights on this service before war broke out when service was abandoned due to lack of support. 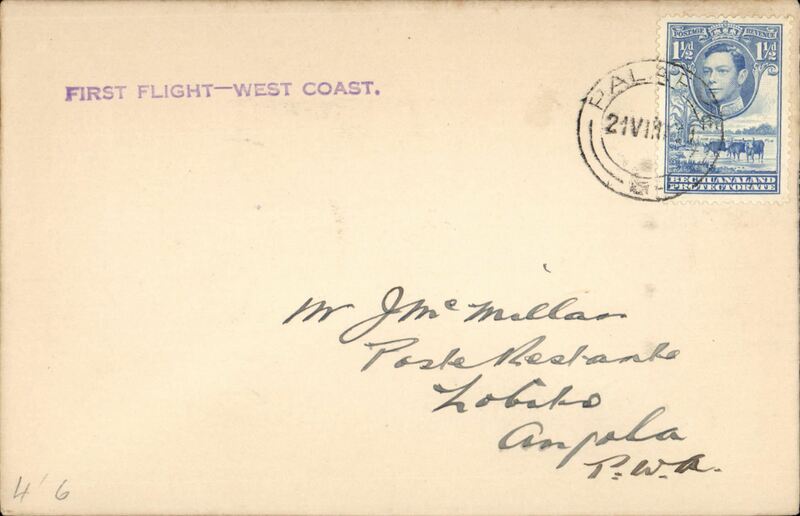 West Coast extension of the South Africa Airways new Kalahari West Coast service, Bechuanaland to South West Africa and Angola, Palapye, Bechuanaland to Luanda, Angola, bs 22/8, airmail etiquette cover franked 1 1/2d per 1/2oz EAMS rate, violet straight line "First Flight West Coast" cachet.. Only three flights on this service before war broke out when service was abandoned due to lack of support. 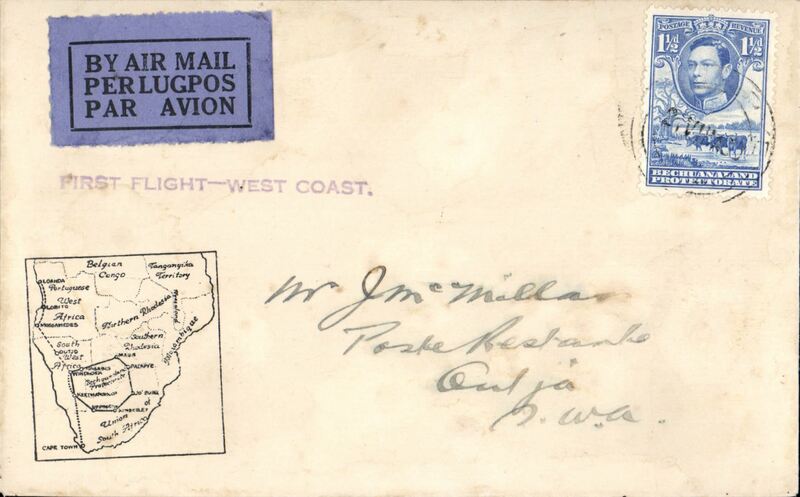 West Coast extension of the Kalahari Desert Feeder Service, Maun, Bechuanaland to Portiguese West Africa, Lobito, bs 22/8, airmail etiquette cover franked 1 1/2d per 1/2oz EAMS rate, violet straight line "First Flight West Coast" cachet.. Only three flights on this service before war broke out when service was abandoned due to lack of support. Few tone spots front and verso. See scan. South Africa Airways new West Coast service, Bechuanaland to South West Africa and Angola, Palapye, Bechuanaland to Outjo, SWA, bs 22/8, violet straight line "First Flight West Coast" cachet.. Only three flights on this service before war broke out when service was abandoned due to lack of support. Scarce item in fine condition. 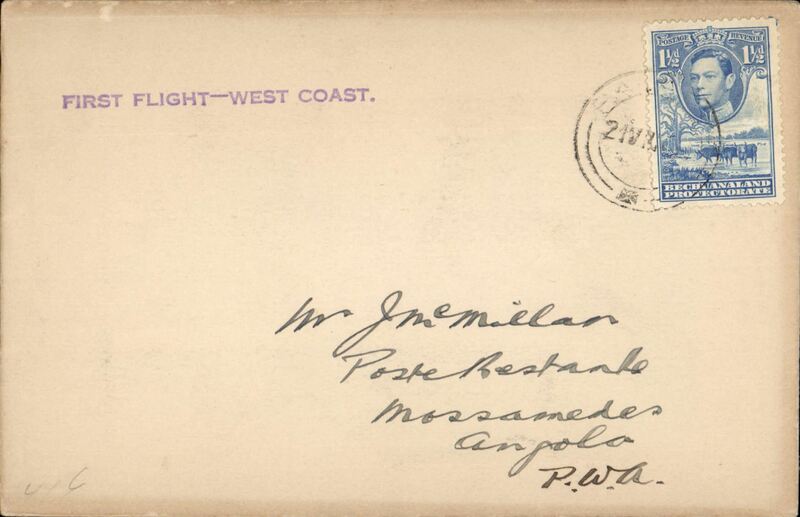 Palapye, Bechuanaland to Mossamedes, Angola, bs 22/8, SAA new West Coast service, Bechuanaland to South West Africa and Angola, violet straight line "First Flight West Coast" cachet.. Only three flights on this service before war broke out when service was abandoned due to lack of support. Scarce. 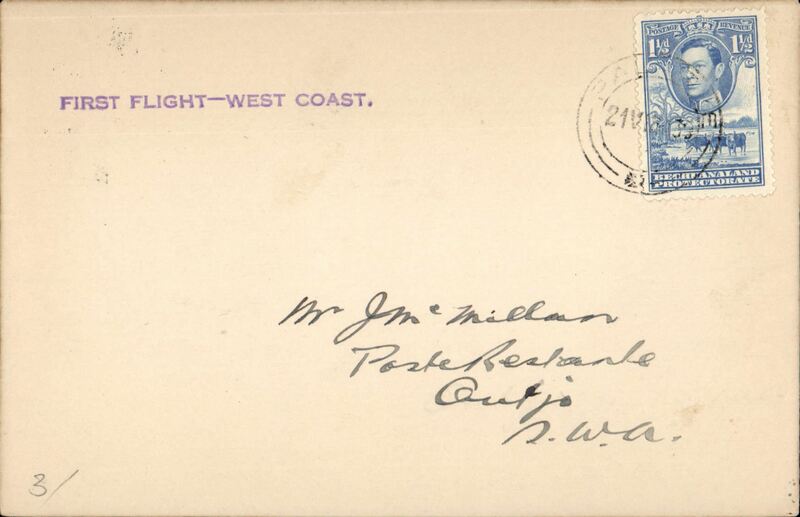 Palapye, Bechuanaland to Lobito, Angola, bs 22/8, SAA new West Coast service, Bechuanaland to South West Africa and Angola, violet straight line "First Flight West Coast" cachet.. Only three flights on this service before war broke out when service was abandoned due to lack of support. Scarce. 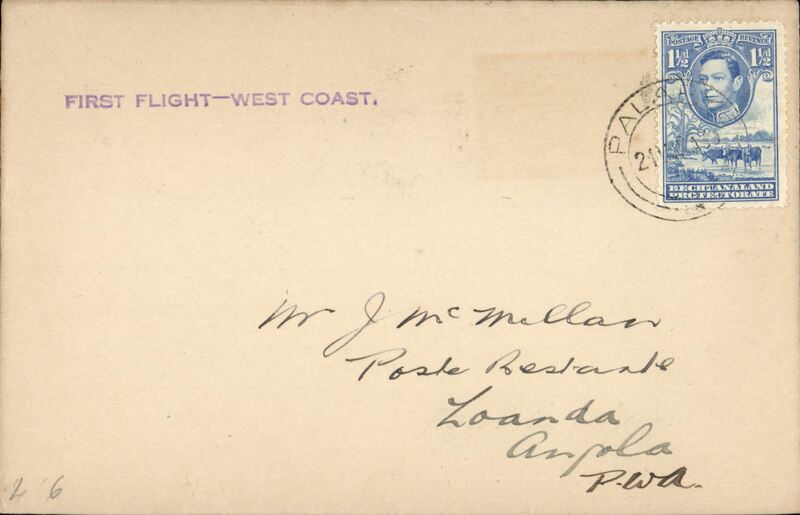 Palapye, Bechuanaland to Loanda, Angola, bs 22/8, SAA new West Coast service, Bechuanaland to South West Africa and Angola, violet straight line "First Flight West Coast" cachet.. Only three flights on this service before war broke out when service was abandoned due to lack of support. Scarce.